Last month Woodside Petroleum made the decision to shelve the multi-billion dollar Browse project, a project which seemed doomed the minute the oil price started slipping – but from day one it was troubled. The Browse fields, off the coast of WA, had long been pencilled in for LNG development at a time when every man and his dog was looking at developing LNG projects in the state. Woodside itself had flicked the switch on the Pluto project and Chevron had Gorgon on the go along with the early stages of Wheatstone happening. Meanwhile new entrant Inpex was looking at Ichthys in WA before settling in Darwin. In the early 2010s, the debate about the LNG industry wasn’t focused on whether projects would get up but rather who would receive the cash. Many of the fields, including the Browse field, straddled commonwealth and WA waters meaning the main argument was who would receive the money from the development of the projects. Not whether they would make money. In the heady days of $100+ oil and a seemingly insatiable appetite for LNG from Asian countries, it seemed projects would develop via their own momentum – despite executives telling all and sundry they needed to carefully crunch the numbers before making a final investment decision. Suffice to say, they were heady days in the WA energy scene. Yet a number of headwinds were to take Browse from promising development through to change and then ultimately the scrapheap. In 2012, the plan for the Browse project was for a 12 million tonne per annum onshore plant at James Price Point, near Broome in WA. Like many projects before it, the plan was to build an LNG project and infrastructure hub onshore and tie back gas from the waters of Browse. Yet, in these heady days the discussion wasn’t really about the oil price but rather the inflating costs of building onshore projects in WA. The iron ore boom combined with the LNG scene had led to a scarcity of workers with the required skills to build the plants. So, over time, the cost of constructing these massive projects in WA came into sharp focus and dominated the political conversation. Talk of labour productivity against the cost of that labour came into sharp focus, and the costs of these projects started to blow out by the tens of billions of dollars. Browse was part of this conversation. The sharp concentration of projects in the north west of WA led to a distortive effect on the cost of labour, and despite the oil price (and the oil-linked LNG price) being more than robust enough to support the projects – the concerns grew. Those concerns were fanned by one of its joint venture partners on the project – which just happened to be one of the largest companies in the world. Woodside was in somewhat of a pickle in those days. Royal Dutch Shell had a 27% stake in the project, alongside BP, MIMI, and PetroChina. At the time (it’s since sold down its stake), Shell had a 23% stake in Woodside – something which would continue to dog Woodside as an ‘overhang’. While normally it may be an advantage to have a major joint venture partner as a direct investor in the company as well, in this case it was a distraction. Shell had its own ideas about the project. It was a pioneer in the floating LNG space, and was working on proprietary technology to make its ideas a reality. These vessels would simply be parked out to sea and function as a gas processing and cooling facility – albeit at lower capacity than an onshore plant. It was speaking openly about the rising cost of onshore projects and how floating LNG could be the answer. Given Woodside was pursuing an onshore facility, the market put two and two together. The cost, however, was blowing out. Perth scuttlebutt suggested that Shell was really calling the shots on the project. Ann Pickard, Shell’s country lead at the time, faced a continuous barrage of questions from reporters about the fate of the project. Was Shell calling the shots? Would the LNG project go ahead? Pickard politely deferred to Woodside as the operating partner, but the perception was there for all to see. On the ground, a campaign against the project came from environmental groups – and a bureaucratic blunder was compounding the issue. 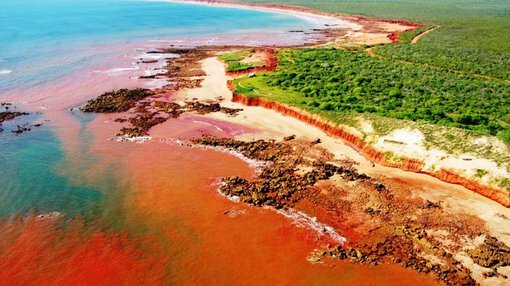 James Price Point is an environmentally sensitive area in the Pilbara and the decision to whack a giant gas factory at the site dismayed several environmentalists. Artists such as Missy Higgins and groups such as the John Butler Trio tried to raise awareness on the east coast of the project’s impacts on the environment, and WA-based groups began their campaign against the project. The project was only slated to take up a portion of the land which would have been put aside for development. While project expansion may have taken up some of this space, there was plenty left for other projects. This is what scared environmentalists. They made the argument that the project was really just a Trojan horse for the wider industrialisation of the area. But while the campaign focused initially on the environmental impact of the project, it broadened to an argument over native title rights. Environmentalists and native title campaigners argued that taking away sacred land was not worth any amount of money. In an effort to allay these concerns, the state government and Woodside came up with an agreement to put up a billion dollar fund to secure the long-term economic future of the region’s indigenous population. Argument soon broke out about whether the group which signed the deal with the state government had the right to do so. At the same time, environmental groups were running a legal campaign to have the project stopped at all costs – and found a chink in the armour: the Environmental Protection Authority. At that stage, the state government had put the proposal for the James Price Industrial Hub (note, not the actual Woodside project) to the relevant authorities. It received the requisite conditional environmental protections, and all seemed hunky-dory. Only, the Wilderness Society challenged the decision in court. It turns out that several members of the five-strong EPA board had conflicts of interest in the investment decision – being shareholders in several of the joint venture participants. This ultimately left the decision in the hands of just one man, Dr Peter Vogel who gave the approval. The Wilderness Society argued that such a momentous decision couldn’t possibly be made by one man. The WA Supreme Court agreed. This forced the state government back to the drawing board on the precinct, and with Shell agitating for a FLNG solution this was seen by many as one of the final straws. Woodside eventually pulled the plug on the James Price Point project in favour of a Shell-led FLNG project. Since that time the price of oil has collapsed, and the joint venture has given up on that option for now. But it is worth casting your mind back to how the James Price Point solution was eventually struck down. Was it a stupid idea to begin with? The decision to walk away from James Price Point teaches us many lessons to this day, and by reading what went into the decision perhaps we can learn from it in future. It’s likely the project wasn’t defeated by any one thing. The project’s costs continued to blow out, which didn’t help. There was a massive environmental backlash, which didn’t help. A major shareholder had a different idea for the project, which didn’t help. The WA government stuffed up on the bureaucratic front, which didn’t help. Invariably, it’s worth asking what would have happened if those issues weren’t at play. Would the project still exist today? Would ground have been broken at James Price point? Maybe, maybe not – but it was a project impacted from day one by inflationary pressures, community pressures, and ultimately market pressures when the price of oil collapsed. In this there are lessons about myriad issues which can affect massive infrastructure projects. The bottom line is that if Australia is to once again become a nation which brings these sorts of project to bear, it needs to learn from the James Price Point episode.